From left, Kevin Overton of Philadelphia, Cherjon Overton of Deptford, N.J., Sally Armstrong of Dallas, Texas, Sterling Overton-Crawford of Fredericksburg, Va., and Dorein Overton of Westville, N.J., pose for a photograph after meeting for the first time. Growing up, Sally Armstrong was an only child. And her family tree? It looked more like a stump. Though she had loving adoptive parents, her background was a mystery — a trail that went cold on the floor of the hospital bathroom in Virginia where Armstrong was abandoned as a baby in 1988. Then, on May 2, she logged onto 23andMe, an online DNA testing service. In the time it took to click into an email, Armstrong learned she had a half-sister. In fact, altogether she had two half-brothers, two half-sisters, six nieces and nephews, plus any number of cousins, aunts and uncles — the big, boisterous family she had grown up dreaming about, but never imagined actually existed. 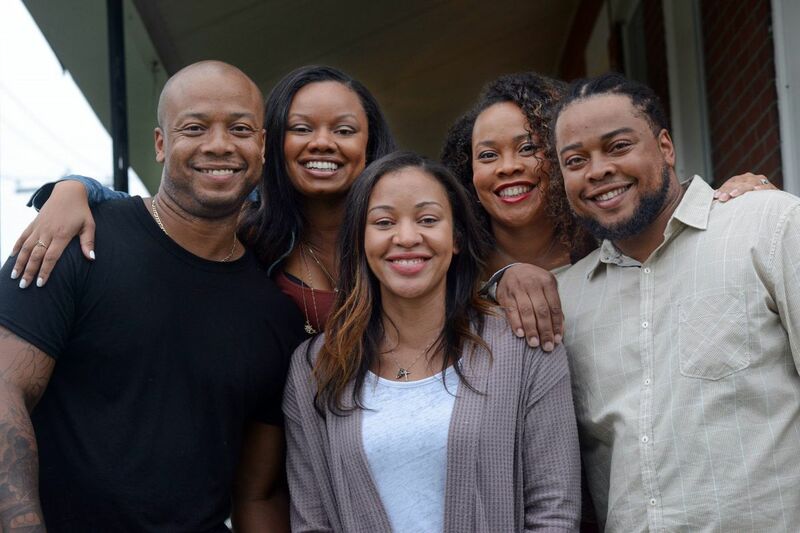 Over the weekend, Armstrong, 29, of Dallas, flew up for a whirlwind family reunion hosted by her oldest brother, Kevin Overton, in Northeast Philadelphia. "I can see myself in them," she said, "That's the crazy thing — to grow up for so long without any family resemblances, and then all of a sudden you can just look at somebody and see it. It definitely makes me feel whole, because I always knew I had some sort of family out there." In recent years, the growing popularity of DNA testing has led to more such discoveries — and not always happy ones, as children track down biological parents who may not want to be found. 23andMe would not disclose statistics, except to note that 95 percent of people who enable the DNA Relative function, which mines data on users' chromosomes to spit out matches, find a family member who is a third cousin or closer. But Armstrong said that when she signed up in February, she really just hoped the $199 service would help her understand her ancestry (77 percent West African) and her medical risks (potentially, macular degeneration). She didn't think much about the DNA Relative function. "The last thing I ever expected was to find a sibling," she said. In fact, when she first logged on, it was just fourth and fifth cousins. "Then," said Armstrong, "we spoke on the phone, and the first thing I remember is I couldn't believe how her voice sounded so much like mine." Sally Armstrong (left) holds her niece, Ari-Lee Overton, as her younger half-sister, Cherjon (center), and older half-sister, Sterling (right), look on, along with other family members. Overton-Crawford had merely been interested in learning more about her ancestry, but instead she found out a family secret. They pieced together what had happened — that their mother had gotten pregnant while the Overtons' father, a military man, was deployed with the Army in Korea, and that she gave birth before he returned. Their father didn't want to be a part of this story but stopped by to welcome Armstrong into the family. The siblings said they're not in contact with their mother, who has been a heavy drug user. "I forgave my birth mother a long time ago," Armstrong said. "I was warm, I was clothed, I was fed and left in a safe place." Initially, Kevin Overton, 36, a Philadelphia police officer, was skeptical that such a thing could have happened in his family. "I'm used to people lying to me all the time. But once I saw her picture, I was like, 'You can't deny that,' " he said. Then, he felt regret. Though he was just 7 when Armstrong was born, he wishes he'd been aware of the situation. "I'm the oldest, and I always felt I was the protector. I feel like I missed out on looking out for her. She didn't know she had all of us." So, this weekend, they were determined to make up for lost time. The whole family crowded into Kevin Overton's kitchen, where he was serving up a barbecue feast, to compare notes on the four siblings' childhood in West Deptford with Armstrong's Texas upbringing. They recounted all the old stories and uncovered the traits they all share, like a love of music, an extroverted nature, and a mutual agreement that mushrooms are not food. They also vetted Armstrong on a critical point: After all those years in Dallas, was she a Cowboys fan? Thankfully, that was not the case. Kevin Overton of Philadelphia cuts ribs as Sally Armstrong, Cherjon Overton, and Sterling Overton-Crawford stand in the doorway. Rodney Armstrong, Sally's husband, stood in a corner, looking slightly overwhelmed by the seemingly endless number of new in-laws he'd inherited. "She always wanted a big family, and it tripled overnight," said Armstrong, 30. He'd tried to prepare her for the reality that they might not be thrilled to see her. "But everyone is so open and welcoming and loving." Armstrong also met her younger sister, Cherjon, 28, of Deptford, and her older brother, Dorein, 32, of Westville. "I was ecstatic and confused," Dorein said. "But it was like a puzzle that came together. When I met her, it was like this is one of my sisters. She's just like us." Leading up to last weekend's visit, the siblings have been texting and chatting nonstop. It inspired Armstrong to make everyone shot glasses, labeled with their roles: the bossy one, the clown, the disciplinarian. On her own glass, she wrote "lost." But no more. "I feel she has a peacemaker kind of vibe to her," Overton-Crawford said. "I think that's her role."